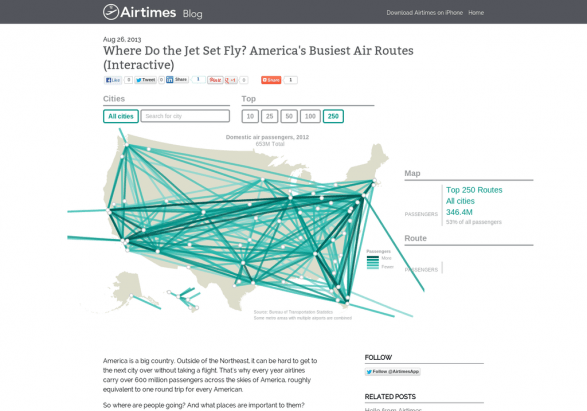 An interactive map by Airtimes Blog of America’s most traveled air routes. Check out where people are flying. Many times we tune out commercials and the products/services that they’re advertising and pushing us to consume. Sometimes a company and/or their advertising agency creates a commercial that is moving and causes us to feel something during the clip. While the emotion may not have anything to do with the product, the commercials below are quite moving and I applaud the agency and companies for such excellent ads. Brilliant Thai Pantene television commercial. The story of a deaf and mute girl who learns to play the violin against all odds. The product isn’t revealed until the end, but now knowing that it’s for Pantene, it makes that her long, beautiful hair was whipping and blowing in the wind inside the concert hall. The use of Pachelbel’s Canon throughout the spot was brilliant. TC Bank- Dream Rangers – Created by Ogilvy Taiwan, this three minute spot shows a group of friends in their 80s, who return to riding their motorcycles for a cherished spot and relive the memories of kinship and experience an active life. They are living! Best Job in the World – P&G London 2012 Olympic Games – Wieden & Kennedy won its fourth straight commercial Emmy Award, this time for its heartstring-tugging, mom-centered “Best Job” work for Procter & Gamble, created out of Anonymous Content and directed by Alejandro Gonzalez-Innaritu.